Every weekday morning Tom and Shane keep you informed about everything that affects you, your paycheck, and your lifestyle. 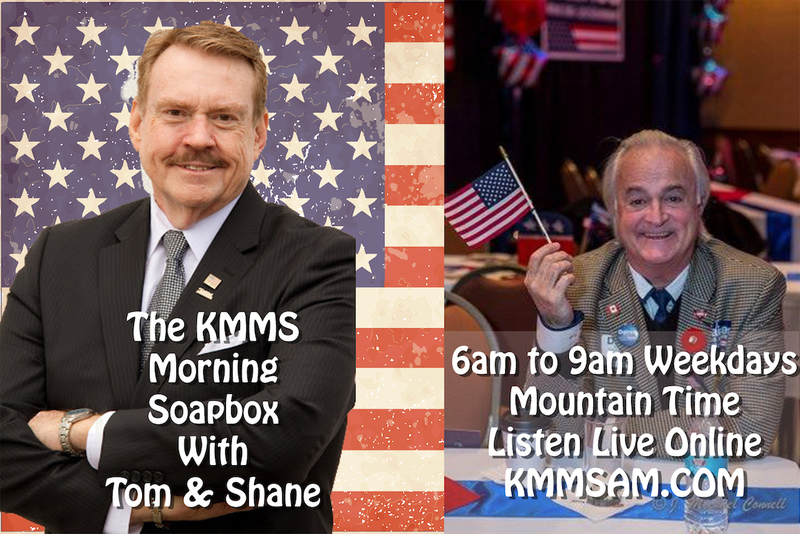 HOUR ONE: Vote in our KMMS Morning Soapbox Poll Question of the Day, “Should Sanctuary Cities Take Refugees?” Topics: County population grows by twenty-five percent, Superintendent of Bozeman Schools taking a job in Missoula, Medcaid bill passes the House, MSU lawsuit, and Romney Hall gets the money. HOUR TWO: Backlash from Mueller Report by Congress, Barr’s point of view questioned, Norte Dame cause found, North Korea tests missile. HOUR THREE: Guest Attorney Jennifer Bordy, Jennifer discussed the ten possible conflicts of interest that are laid out in the Mueller report and whether they have and legal standing. Interesting discussion. HOUR ONE: Vote in our KMMS Morning Soapbox Poll Question of the Day, “Do You Prefer Vintage or Modern Clothing?” Topics: Romney Hall closer to getting renovation funds, Yellowstone Park Roads to be opening, Netflix streaming, the necessity of college. HOUR TWO: Huge muti-state opiod arrests, Mueller Report released, Korean Missile test, Capitalism vs. Socialism – Who will win. HOUR THREE: Catch up of text messages, are we a democracy or a republic, callers had many positions on this. Should immigrants be transported to Sancutary Cities? HOUR ONE: Our KMMS Morning Soapbox Question of the Day, “Will The Mueller Report Clear President Trump?” Topics: Livingston judge blocks gold mine north of Yellowstone Park, private land rights, drilling, mineral rights and more. HOUR TWO: Barr orders immigration judges to deny bail to asylum seekers, donors contribute millions to rebuild Notre Dame Cathedral, FBI seeks 'extremely dangerous' woman who threatened Columbine High, Trump vetoes resolution to end U.S. involvement in Yemen war, White House officials reportedly bracing for Mueller report fallout. HOUR THREE: Guest Money Guru Mike McCormick – Topics included student loans and is there really a need for a college education in today’s world. Lots of calls on this topic. HOUR ONE: Our KMMS Morning Soapbox Poll Question of the Day, “Should cookies be called "bakies" since they are baked not cooked?” Topics: Fire at Notre Dame Cathedral, Medicaid bill in Montana Senate, two school safety bills, the Bozeman Commission’s vision of downtown, River Rock Fish issue, new MSU grad school dean announced. HOUR TWO: More on Notre Dame, Bernie Sanders Town Hall, Sanders and O’Rourke release tax returns, House to subpoena banks looking for Trump Russia ties, Mueller report to be released on Thursday, Trump may have a challenger on the Republican side for president in 2020. HOUR THREE: Guest Jeff Krauss Bozeman City Commissioner, commission discusses the downtown overlay, down zones for less density, effects on downtown businesses, is Bozeman redefining the downtown customer? HOUR ONE: Our KMMS Morning Soapbox Question of the Day, “How Old Were You On Your First Date?” Topics: Medicaid fails in Montana Senate, new trail planned to the “M,” airport expansion starting, high school debate team excels, new affordable housing manager in Bozeman, MSU student election. HOUR TWO: Trump explored sending migrants to sanctuary cities, Rosenstein questions Barr deceiving public, Ex-oil lobbyist David Bernhardt confirmed as Sec. of Interior, Ohio heartbeat bill passes, Disney streaming to take on Netflix. HOUR THREE: Guest Jennifer Bordy – Law Talk – Topics: Class action lawsuits, the arrest of Julian Assange. Assange brings up many questions. Will he be extradited to the US? What about Sweden that also want to talk to him? Does the US really want all the information he seems to have? Enquiring minds want to know. HOUR ONE: Our KMMS Morning Soapbox Poll Question of the Day, “Should Rural Montana Schools Have Armed Guards?” Topics: William Barr testimony, Local construction company to work on Southern border wall, The Extreme History Project moves into home with checkered past. WikiLeaks' Julian Assange arrested in London, Treasury Secretary slow to release six years of Trump’s Tax Returns, Sudanese President Omar al-Bashir is out, British Prime Minister Theresa May has accepted an offer from European Union leaders to extend Brexit until October 31. HOUR THREE: Income Taxes — are they voluntary? Former Senate Majority leader tries to make that case, callers and texters has a lot to say about the Trump’s tax returns, plus many comments on taxes in general. HOUR ONE: Our KMMS Morning Soapbox Poll, “Should William Barr Release The Unredacted Mueller Report.” Topics: MSU research head leaving MSU, Madison River director resigns, Historic Preservation by city commission, Spanish Peaks buys hotel for employee low cost housing, should there be armed marshal’s in rural schools. HOUR TWO: Barr Report expected next week, Netanyahu wins, Trump not reinstating family separation at the border, Social Media execs in Washington to testify on hate speech, Magic Johnson steps down and director of LA Lakers. HOUR THREE: Guest Mike McCormick, McCormick Financial Advisors, talking about taxes, Brexit, investment, currencies, emerging markets and more. Tom and Shane finish out the hour with College Gate. Celebrities paying to get kids in prestigious schools. HOUR ONE: Our KMMS Morning Soapbox Poll Question of the Day, “Do You Know How To Use Chopsticks?” Topics: Will Northwestern Energy buy Colstrip, the Gallatin Front gives a $400,000 check for the 443 acres, and a teenager survives a grizzly bear attack. HOUR TWO: More shakeup at Homeland Security, William Barr to testify before congressional appropriations committee, reparations favored by Democrat candidates, Israeli Election, Judge blocks Trumps migrant asylum idea. HOUR THREE: Trumps tax returns, making it in America, poverty, lots of calls and texts during this hour, also reparations, taxes, the 16th amendment. All in all, a fun morning. HOUR ONE: Our KMMS Morning Soapbox Poll Question of the Day, “Bungie Jumping or Skydiving?” Vote. Today’s Topics: US Trade Policies making it tough on farmers, affordable housing and the City Commission slush fund. HOUR TWO: More on affordable housing, Homeland Security Sec, Kirstjen Nielson is out of a job, Trump's tax returns and congress, ‘Beto’ O’Rourke calls Netanyahu racist, Rwanda 25 year recognition of genocide. HOUR THREE: Montana Senate President Scott Sales and Steve White, Badbills.com, were on hand to handicap the last three to four weeks. Discussion of Montana candidates running for public office and how that will affect the makeup of the Montana Land Board. HOUR ONE: Our KMMS Morning Soapbox question of the day, “Should a Fetus Be Considered a Person?” Topics: Al Olszewski officially running for Montana governor, names submitted for new high school mascot, state budget moving along swiftly, astronaut Kelly at MSU, the Grizzly panel trying to keep grizzlies and humans separated, two Montana town want to raise resort taxes, Hawk Night a huge success. HOUR TWO: Tom and Shane discuss the townhall meeting on Fox with Starbuck’s former CEO Howard Schultz and his possible run as an independent for president. Barr report OK’d by DOJ, Cohen finds a hard drive with more Trump info, Boeing admits responsibility for air disasters, Herman Cain might be headed to the Fed, Captain Marvel movie – first movie directed by a woman to make $1 billion. HOUR THREE: Montana Attorney General Tim Fox talks about his efforts to stop robocalls. He also discussed his views on Obamacare and Medicaid in Montana.